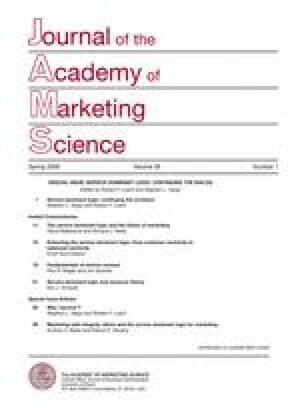 Since the introductory article for what has become known as the “service-dominant (S-D) logic of marketing,” “Evolving to a New Dominant Logic for Marketing,” was published in the Journal of Marketing (Vargo, S. L., & Lusch, R. F. (2004a)), there has been considerable discussion and elaboration of its specifics. This article highlights and clarifies the salient issues associated with S-D logic and updates the original foundational premises (FPs) and adds an FP. Directions for future work are also discussed. We would like to thank David Ballantyne and Richard Varey for their insights and suggestions for developing this commentary.